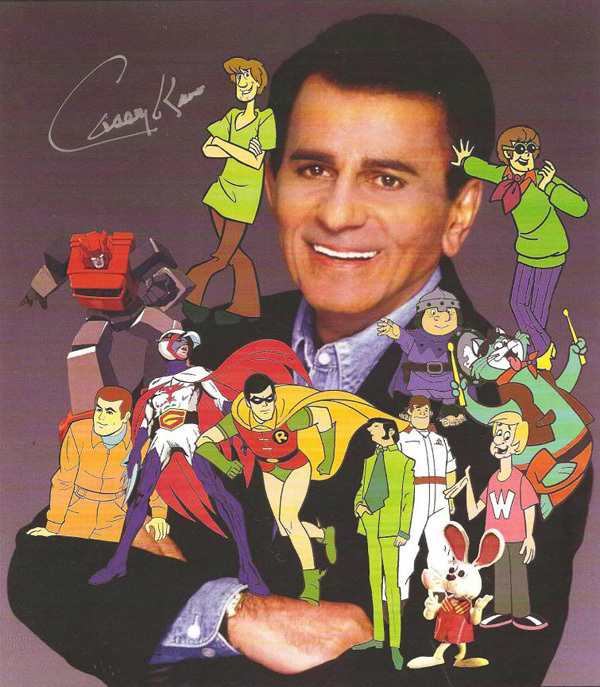 Legendary voice actor, disc jockey, and radio personality Casey Kasem as died at the age of 82 following a battle with Lewy body dementia. Born Kemal Amin Kasem in Detroit in 1932, he was the son of immigrant parents. Kasem served in the Army in the 1950s and became a disc jockey in Korea. That led him to work as a DJ in various cities across the country before launching the nationally syndicated radio show American Top 40 in 1970. He stayed with the program until 1988 and returned from 1998 until 2004. On television, he hosted the Shebang dance show weekday afternoons in Los Angeles. His first animated voiceover job was playing Robin on the 1968 Batman series for Filmation. He continued to play the character in all of the various Super Friends incarnations for Hanna-Barbera. He’s perhaps best known for playing Shaggy Rogers, Scooby’s often-terrified pal, in the various incarnations of the Scooby-Doo cartoons. He created the role in 1969 and continued to play the character until 1995. He returned in 2002 and continued until 2006. His final roles included playing Shaggy relatives in Shaggy & Scooby-Doo Get a Clue! and Scooby-Doo! Mystery Incorporated. Other animated characters include Alexander Cabot III in Josie and the Pussycats and Josie and the Pussycats in Outer Space; Mark in Battle of the Planets; and nephew Waldo in What’s New Mr Magoo?. Kasem also had a long list of credits from voicing commercials. He had been in ill health for some time and had become the subject of a feud between his children from his first marriage and his second wife, Jean Kasem. What do you think? How will you remember the work of Casey Kasem? As a DJ or a cartoon voice actor? He will always be Shaggy, to me! I’ll always remember you Casey Kasem from the 1989 episode of the Saved by the Bell were Lisa and Screech doing the spring. R.I.P. CO you will be missed.